Oakland's new chief resiliency officer will help city prepare for catastrophic events and overcome chronic social problems. 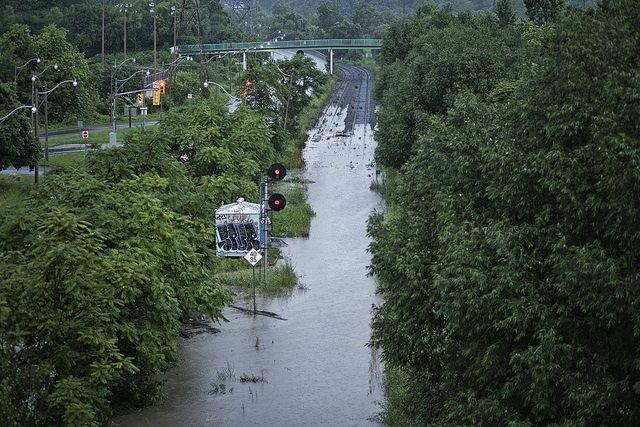 Flooding in Toronto, July 2013. Photo by Woodrow Walden, from the Torontoist Flickr Pool. How resilient is our city? That’s a challenging question—one that demands consideration of a wide range of social, political, and economic issues—but it’s also a critical one. Urban resiliency, or the ability to cope with catastrophic events and long-term stresses, is vital to a city’s success. Salinas has worked on the World Bank’s disaster risk management team, at FEMA, in the US State Department, and for the United Nations Development Programme. As Oakland’s CRO, she will be a senior civil servant tasked with leading a six-to-nine-month initiative aimed at developing and implementing strategies for dealing with four resiliency priorities: seismic disasters and their impact on 24,000 unsafe housing units; climate change fallout, including rising seas and extreme heat and precipitation; the social vulnerability of city residents; and aging housing and infrastructure, and City financing limitations. Salinas will also lead the implementation of Oakland’s energy and climate action plan. Those are some pretty broad and complex issues. It’s difficult to see how anyone, even a dedicated CRO, could tackle issues related to everything from social vulnerability to extreme precipitation in under nine months. But the aim of Oakland’s resiliency work is to unite various municipal departments and representatives from the community and the private sector in creating a “roadmap” for resiliency work. In other words, the main job of the CRO is to get people talking openly and constructively about solutions to some of the city’s greatest problems. Aside from the seismic catastrophes, Oakland’s resiliency priorities could very well be applied to Toronto, or to almost any major city. Climate change, for example, is increasing the frequency and severity of extreme weather. Just think about the flooding Toronto has experienced in the last two summers, or the ice storm that left much of the city blacked out this winter. Are we still resilient in the face of major storms? Much of the infrastructure cities have had in place for decades to deal with storms and flooding is no longer suited to dealing with changing climate conditions. Which is not to say that Toronto necessarily has to hire a global expert like Salinas and declare her a chief resiliency officer—cool as that may be. The key to building resilient cities is, as Rodin said, proactive management. Getting municipal government and public and private actors brainstorming, talking, and thinking about ways to make Toronto stronger and more prepared would be a critical first step.